Dr. Melissa R. Lewis, O.D. Home » Our Doctors » Dr. Melissa R. Lewis, O.D. 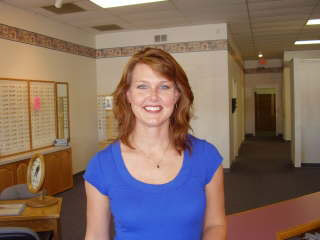 Dr. Lewis began working in the optometric field at the age of 16 when her family optometrist offered her a job. She earned her undergraduate degree from Northeast Missouri State University and her Doctor of Optometry from the University of Missouri-St. Louis. Dr. Lewis has served as an adjunct assistant professor at the University of Missouri-St Louis School of Optometry. Dr. Lewis acquired 20/20 Vision Care in Arnold in 1998 and opened the Ballwin office in 2000. She emphasizes the importance of eye health during her examinations and takes the time to spend with each and every patient. By the ever-present smile on her face you can tell our doctor is passionate about her calling. Outside the office, you’ll find Dr. Lewis enjoying time with Darrell, her husband of 21 years, together with friends and family and visiting wineries. She is also a dedicated volunteer at JoyFM, a local Christian radio station.